Jonathan Prince Studio is pleased to share our top picks from Frieze New York this past weekend, as well as highlights from Chelsea galleries and the Whitney Museum. Frieze New York is an international contemporary art fair that launched in May 2012. In 2015 the fair includes over 190 of the world’s leading galleries, making Frieze New York 2015 the company’s largest event to date. Like Frieze London, Frieze New York is housed in a bespoke temporary structure, suffused with natural light. The fair is located in Randall’s Island Park, Manhattan. 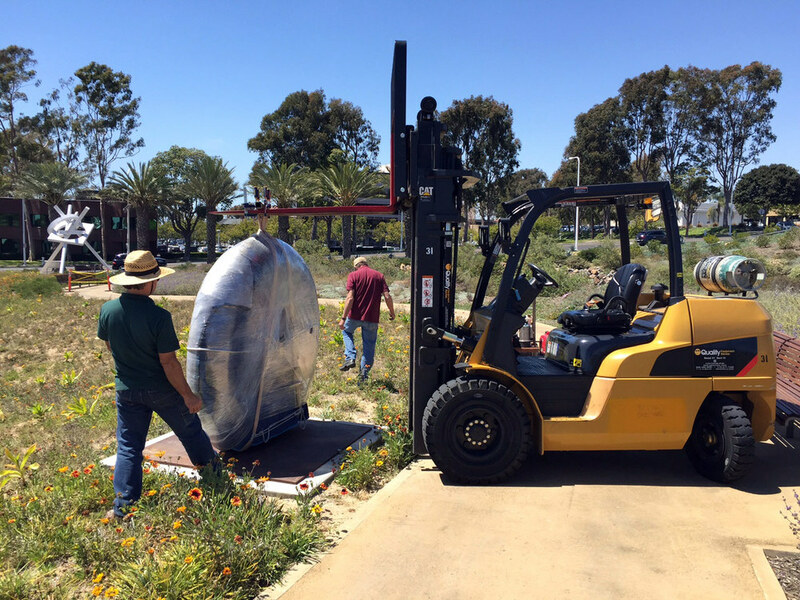 Jonathan Prince, in collaboration with Cynthia-Reeves Projects of New York, was selected to contribute a monumental sculpture to the Newport Beach Inaugural Sculpture Exhibition at the Newport Beach Civic Center's 14-acre ocean-view site. 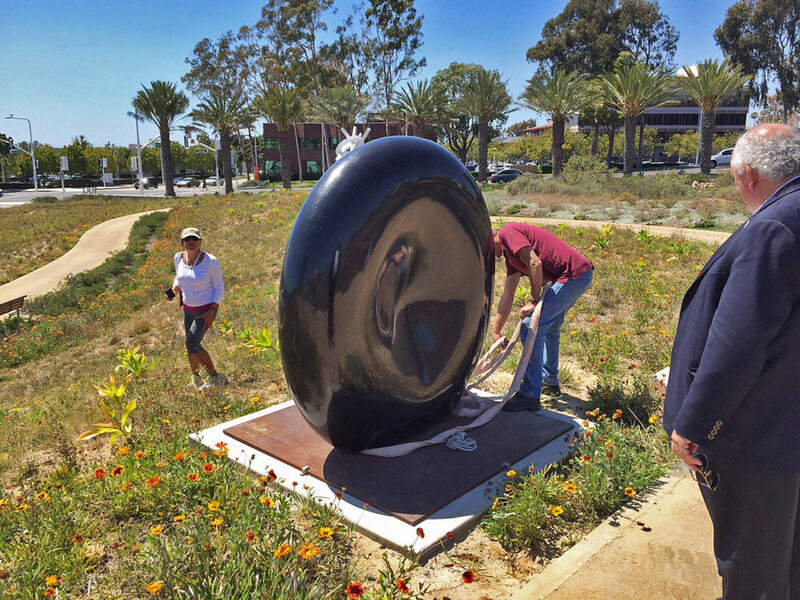 Red, a work carved from African black granite, was installed on April 27 and will remain on view through August of 2016. 260 submissions from artists located worldwide were received and juried by a local selection committee consisting of up to three Newport Beach Arts Commissioners, two local arts professionals (Dan Cameron, Interim Director and Chief Curator at the Orange County Museum of Art and Richard Turner, Artist, Professor, and Co- Director of The Guggenheim Gallery at Chapman University), and Christina Varvi, art conservator of Rosa Lowinger & Associates, Los Angeles and Miami. Prince was one of ten artists chosen to participate in the exhibition. Red is a bi-concave disc form with a mirror-polished surface designed to reflect the environment in which it sits. The reflected images morph and distort, pulling the viewer from the illusory comfort of perceived order. Red is a part of Prince’s ongoing series entitled States of Matter, a body of work that represents the artist’s interest in exploring the ways in which we perceive materials – or phases of matter (solid, liquid, gas, plasma) – and our understanding of how such materials behave and influence our lives. Several sculptures by Jonathan Prince are featured in the current exhibition Subtle, Not Subtle: Evocative Nuance at West Branch Gallery and Sculpture Park in Stowe, Vermont. “Subtle, Not Subtle: Evocative Nuance” focuses on the delicate complexity of artwork by Marc Civitarese, Janis Pozzi-Johnson, Jonathan Prince, and Helen Shulman. “Subtle, Not Subtle” focuses on four artists whose work displays a delicate complexity that is easily overlooked by the casual viewer. Marc Civitarese abstracts the elements of realism–shape, form, and light–as a way of showing an introspective exploration of mankind, nature, and spirituality. Janis Pozzi-Johnson paints emotional, earthy tones in thick wax layers to form viscous color fields “as a visual metaphor for the often ineffable experiences of the human heart.” Working in oil and cold wax, Helen Schulman crafts paintings that engage the viewer in a quiet conversation about color and surface texture. These loose, gestural, and expressive paintings contain an undercurrent of spirituality and strong emotional overtones. Jonathan Prince’s steel sculptures contain some element that is torn or broken. These infractions are gloriously polished to reveal the tension of imperfection. Together, these artists invite the viewer to join them in the act of contemplation and to explore nuance and subtlety in artwork. These artists reward the viewer with a powerful experience; emotional earthquakes that are anything but subtle. The exhibition is part of West Branch Gallery & Sculpture Park’s expanded exhibition program in 2015. The new program features a series of exhibitions that allow for a deeper reflection and interpretation of gallery artists and sculptors. “Subtle, Not Subtle” is curated by Ric Kasini Kadour and West Branch partner Tari Swenson. 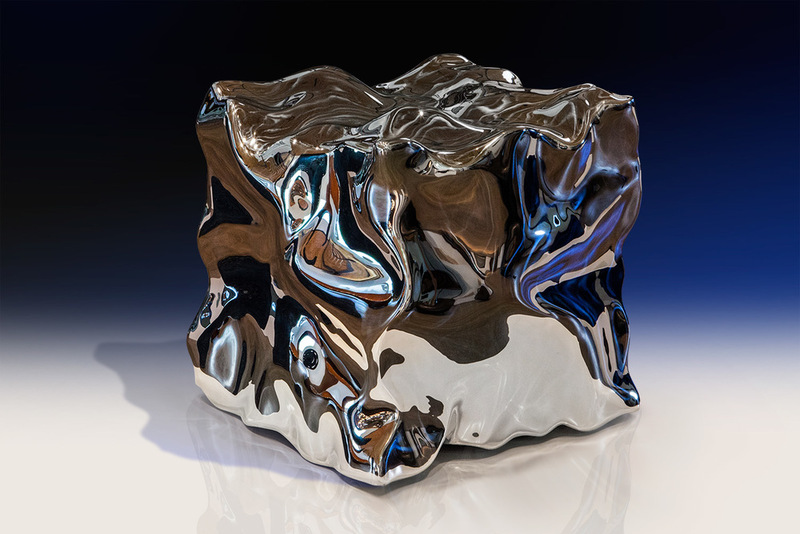 Jonathan Prince will exhibit works from both the Liquid State series and the Torn Steel series with Cynthia Reeves Gallery at the upcoming Art Central art fair, in conjunction with Art Basel Hong Kong, opening March 14. Art Central is Hong Kong's exciting new art fair, showcasing the next generation of talent alongside some of the most established contemporary galleries and art spaces from across the globe. Launched by the founders of ART HK, Art Central debuts 14-16 March 2015 (VIP Preview 13 March 2015) to coincide with Art Basel's Hong Kong edition. The work of Massachusetts-based artist, Jonathan Prince, is currently on view until November 18th, at the Sculpture Garden in the atrium of the old IBM building, in New York City. Shown under the title Torn Steel, the work like the artist, himself, who resembles Julian Schnabel—is big, bold and undeniably ambitious. But underneath the swagger of the man and his work— observations based on an in-depth studio visit, a couple of wide-ranging conversations of the inquiring kind and, of course, the four, eye- to-mind grabbing sculptures on view—lives a sensitive soul, albeit on top of a simmering volcano. His innards seem to house an acute and restless intellect that appears to know no bounds. Though relatively new, as a full-time practitioner to the art world, that is, Prince has only been sculpting 24/7 for the past eight years, a somewhat unbelievable fact given the sure-footedness of his work. As a young boy he was drafted into the world of art through a series of visits with his father to the studio of artist, Jacques Lipchitz. It was here that he was first exposed to contemporary art, to Lipchitz’s extensive collection of pre-Columbian sculpture, and where he experienced, first hand— with a few demonstrations by the master himself—what it meant to be an artist. our industrial civilization—does just that. At first glance, Prince’s monumental sculptures appear to be nothing more than simple geometric forms: a square with a broken edge: a column with its top gouged; a couple of circular sculptural riffs, one resembling a large distressed pill set on edge, the other a partially eaten donut doing a clever balancing act. On closer examination, the lively quartette begins to take on an otherworldly, if not quasireligious, cast. Refraining from the impulse to begin praying, we ask ourselves: are these objects relics of worship from a lost civilization; artifacts left behind by a race that has died off; a Hollywood studio prop leftover from a long-forgotten Roman epic; or are they really post-modern sculptures waiting to be transported to some city plaza? “torn” out of the sculpture with a powerful plasma torch. Then the stainless steel plates are shaped, welded into the form, the patterns are overlaid onto the plates with a MIG welder in stainless steel, and all areas smoothed and blended with a TIG welder. Finally, the stainless steel areas are smoothed and polished with various abrasives. The most satisfying and easily digestible of the four sculptures on view—also the most challenging in its simplicity—is Vestigial Block, Prince’s six-foot square cube. It is here at the steel cubiform, unfettered and uncomplicated by the edgy and visually jagged cuts and molten steel plating found at the top of Totem and at either end of Torus—making them a bit too fussy for my taste—that Prince’s technique of exposing the seemingly soft molten innards buried within the sculpture’s hard outer shell is at its most natural and pleasantly poignant. It is also at this stop, while basking gently in the light of this daringly modest sculpture, that our mind is gently seduced into conjuring up images of the earth’s fiery center, overflowing lava, and thoughts of the human body housing an active soul.